Why Do Goldendoodles Need Grooming? Wahl Large Pin Bristle Brush. Conair PRODog Pet-It for Dog, Boar Bristle Brush. Picking the best brush for Goldendoodle dogs can make grooming your precious pup easy and so much fun, together. Goldendoodles have become almost as famous as their pure-lines for their low-shedding hypo-allergic coats. If you are here because you are searching for the best brush and best grooming tools for Goldendoodle dogs, we are happy you are here! 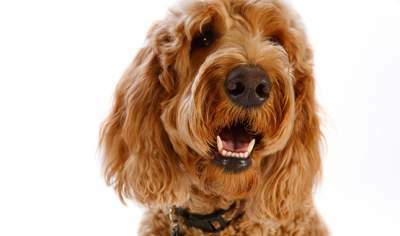 Read on to learn some valuable information about Goldendoodle grooming! Grooming your Golden Doodle will only become strenuous and a chore if you avoid clipping and brushing. Generally, the Goldendoodle coat is mostly considered to be easy to maintain and low shedding. However, any responsible breeder will warn you that it can be hard to say what your puppy’s adult coat will look like. Your pup could take after her Poodle parent and have a thick, curly, wirly, short, low-shedding coat. Because of this, if you plan to invest in high-quality grooming and brushing tools for your Goldendoodle, you may want to wait until your puppy’s adult coat has begun to grow in and you see what coat type your puppy inherits and grows! Goldendoodle grooming typically includes a basic full-dog brushing on a daily basis to eradicate trapped debris, dirt’s, and pests from your active dog’s coat. Plus, the Goldendoodle’s floppy ears keep the inner ear canal from getting enough air circulation. So, you should check and clean the ears each time you brush your dog. Brushing and grooming at home can take time, so many Goldendoodle owners balance Goldendoodle dogs at home with professional grooming. Basic trims and brushing can often be done at home. But it can be faster, cleaner and nicer to have a professional groomer take care of more intensive Goldendoodle grooming needs such as periodic trims, nail clipping, bathing, and haircuts. Knowing when and how to brush Goldendoodle dogs starts with making sure you have the right tools. This is the first step to preventing Goldendoodle matting. For brushing, you will need a brush and comb that will penetrate your dog’s thick coat without causing injury or abrasion to the skin. You will need (at minimum) a slicker brush, steel round-tipped comb, and shears. You may also want to select a detangling spray to spritz on if you discover any mats or tangles in your Goldendoodle’s coat while grooming. The Goldendoodle puppy coat is commonly easy to take care of! The coat is normally finer, thinner, and shorter than an adult Goldendoole’s coat, regardless of wich parent dog your puppy happens to take its features most. When you first begin to bathe and groom your Goldendoodle puppy, don’t be surprised if your puppy seems a little nervous. By talking calmingly to your pup, offering lots of pats and love, having some favorite treats on hand, and moving gently and slowly from on task to the next can help your pup get used to being bathed and groomed and even come to enjoy it! For young puppies’ finer, thinner coats, sometimes a nice finger-combing is all you will need to do. Then you can brush out your puppy’s coat with a steel round-tipped comb, a pin and bristle brush, or a slicker brush as you prefer. Be sure the brush you choose is gentle enough for your puppy’s sensitive skin. Even after your Goldendoodle puppy grows into an adult, it is still smart to do an initial finger-comb to locate tangles and mats before you start using grooming tools. This will help you avoid causing any form of discomfort to your dog. Many Goldendoodle breeders and owners may prefer to bathe before or after doing the complete grooming. If you bathe first, you risk making tangles and mats worse, but you can also add a leave-in conditioner to help you with that. If you bathe after you do the first grooming, you may unnecessarily create mats or tangle. Here again, detangling spray and leave-in conditioner can help with the final brushing and comb-out. Be sure to be gentle when doing your initial comb-through and stop immediately if you feel a mat or tangle. Remember, your dog’s skin is quite sensitive, and any unnecessary tugging can cuase abrasions which may lead to skin infection. After you have combed out ad finger-combed your dog’s coat, you can use a slicker brush to smooth the coat and add more shine. The face, armpits, feet, and pivate areas may need a bit of extra gentle care plus more frequent trims (if you have your groomer do this, just ask for a “Santary cut”). For these areas, you can use your shears to keep out your dog’s eyes and trim away hair in other areas. To prevent matting, you should brush your Goldendoodle regularly. This also keeps your pup looking his healthy, fluffy best. Dealing with (and preventing) Goldendoodle matted fur is not an easy task, and many groomers will resort to just shaving the mats out if they’re not prevented. This video, although not performed by a grooming professional, offers a demonstration for how to brush your Goldendoodle at home, which is nice to know. Here is a longer, more detailed video of how to brush and de-mat a Goldendoodle, providing by a professional grooming business, if you’re interested in learning more about the process and seeing it demonstrated. Having your dog professionally groomed every 3-4 months, or as recommended by your groomer or vet, is very important to keeping your pup’s coat looking healthy. It also helps to protect vulnerable areas on their body like the face, ears, and underbelly area. But professional grooming should never become a substitute for frequent home care, so it’s important to understand how to prevent Goldendoodle matting (and deal with it) by proactively brushing a Goldendoodle at home. But how often should you brush your Goldendoodle, and what types of brushes are the best? How often should you brush a Goldendoodle? Although Goldendoodles do not shed, or at least not too much, their coat stil demands regular brushing. In fact, because they don’t shed, and because their hair tends to be curly, they have an even greater propensity to develop mats and tangles, majorly in the dog’s undercoat. Brushing a Goldendoodle frequently is important for avoiding painful – and ugly – mats on your pup. It is recommended that you brush your Goldendoodle at least every other day to avoid mats from making their hair a mess. Others recommend that you brush your dog on a daily basis, so if you’re able to do so, that is even best. Failing to brush pup puts him at the risk of accumulating bacteria and dirt on his coat, causing him to contact skin infection. I know what you’re thinking – Brushing my dog every day seems like a rather arduous task… T’is true. I know how busy you can get, but it’s important to build it into your daily routine at a set time or after a particular activity. For example, if you take your dog for a short walk around the block in the evening, take 5-10 minutes as soon as you return home to brush your dog…. You can put on a relaxing music if it helps. This will smoothen the process for the both of you and make it seem less like something you have to find time for every day, as you will have already built in the time for it. When you brush your dog, be sure to brush his entire coat (ears, tail, underbelly, and legs; front and back included). Your Doodle even has multiple layers to his coat, which are important to reach, as well. Avoid just skimming a brush over the top of your dog’s coat. Really work to reach all of the layers. If unfortunately your dog develops mats, be aware that those areas will be sensitive to her when you brush. Make sure you attempt to detangle the mats, but watch your dog’s skin in the process. Kickstart a frequent brushing routine with your Goldendoodle she’s still a puppy, that way she gets used to it and doesn’t struggle against you. If you do not brush your Goldendoodle regularly and she becomes matted, these mats may be almost impossible to get out with a brush. A professional groomer may instead recommend shaving them out of your dog. This is best avoided, if possible. If you will be hiring a dog sitter, going out of town, or leaving your dog at a kennel while you are away, make sure that your dog’s temporary caregiver is aware of her daily brushing needs and agrees to perform them. Otherwise, you could return home to a messy, matted pup! Choosing the best brush for Goldendoodle dogs is quite a personal decision! Your hand size, grip preferences, arm strength and other factors may influence which brush you favor. Your choices include a bristle brush, a slicker brush, a pin and bristle brush, or all three. You may want to try all three. With plenty different kinds of dogs in across the globe, these are lots of many brushes and other grooming products available. Since Goldendoodles can have different cost types, different dogs can need different brushes. Here are some things to look for in a good brush for your Goldendoodle. Different good brushes have wooden handles and backs. This is because wood absorbs the oils from your dog’s skin, helping to distribute it through his coat. For many years, wooden brushes were considered the best for grooming and many groomers and owners still consider them best today. Some brushes with plastic handles and backs can be cheap and inferior in quality but not all of them. It depends on how the brush is made, how it feels, and other factors. Some of these brushes are ergonomic so they fit in your hand well and they’re comfortable to use. Brushes with rubber handles can also makes these brushes more comfortable to use. Good quality brushes should be well-made and durable. Reading product reviews from groomers and owners who have used the brushes is always helpful. If people report that a brush only lasted a few months, then it’s not worth buying. Good quality brushes should be comfortable on your dog’s skin and coat when used correctly (any brush or grooming product could irritate your dog’s skin if used incorrectly). And it should, ideally, help your dog look good if it’s the right brush for your dog’s coat. Sometimes it does take some trial and error to choose the best brush for your dog. Most professional groomers have drawers of brushes they have bought to try out before finding a few that they use most often. There are 3 different types of brushes and, depending on your Goldendoodle’s coat type, you may need one or more of them. Bristle brushes differ according to the spacing between the bristles and the length of the bristles. Dogs with short coats need bristles that are closer together and shorter. And dogs with long coats tend to need widely-spaced, long bristles. Plus, a dog with coarse hair needs stiffer bristles while a dog with soften hair needs softer bristles. A regular bristle brush might not be needed if your Goldendoodle has a curly coat. He/she may only need a pin brush for grooming and a slicker brush after baths and to cope with any small mats. On the other hand, dogs with wavy or fleecy coats may need this type of brush. You can also use these brushes on Goldendoodle puppies. Historically, the best bristle brushes have had boar bristles or a mix of boar and nylon bristles. Brushes that have only nylon bristles tend to break the hair. A wire pin brush may or may not have rubber-tipped ends. Pin brushes are a cool choice for dogs with curly, woolly, and long coats. They are a great choice for most Goldendoodles. Pin brushes have “pins” that separate hairs in your dog’s coat. A good pin brush should have a good cushion with pins that are smooth and strong. The handle must be comfortable for you to hold on. When using a pin brush you should avoid scraping your dog’s skin with it. What you want to do is brush the hair, not the skin. Like bristle brushes, pin brushes come with pins in various densities and lengths. A common bad side with pin brushes is that some of them have a tendency for the pins to push in to the cushion after you use them a while. You can pull the pins back out to where they ought to be but once they become loosened the in brush becomes less effective. These have lots of fine, tiny wire pins set in a cushion bed. These brushes are really helpful when removing small tangles and mats. They are also good to use after giving a dog a bath. The pins are flexible or bendable. They are really small but you should be careful not to use a slicker over the same place on your dog’s body repeatedly or you could irritate the skin. Other grooming items that can be useful when grooming a Goldendoodle include a dematting tool to make removing mats easy; and a comb such as finishing comb or Greyhound comb. Dematting tools include things like the Furminator, dematting combs, Mars Coat King, undercoat rakes, and others. If your dog seems to struggle with mats and frequent grooming doesn’t solve it, you might consider one of these products. However, care must be exercised when using any of these tools because they are very sharp. They involve splitting or cutting mats in some way. You might also consider using a detangling conditioner to try to prevent your dog’s coat from matting or tangling so easily. Grooming and brushing your dog often is generally the best way to event mats. If you need a comb for your Goldendoodle, there are a lot of good ones. We like Greyhound combs which are easy to find. For a lot of owners, the best brush for Goldendoodle dogs is a slicker brush. This becomes more of a necessity if your Goldendoodle takes more after his Golden Retriever parent, with that thick double layer coat that will shed more throughout the year. The Furminator brush deShedding Tool for Dogs, Large, Long Hair. is a top pick that gets rave reviews from owners of dogs with intensive grooming needs like the Goldendoodle. They are primarily made for dogs with medium, curly, or long coats, like your pooch. One of the greatest aspects is the one-push self-cleaning brush button found at the top of the brush handle. If you’ve never seen a slicker brush before, it has closely spaced metal bristles that you run through the dog’s coat. They are specifically made to remove mats. If you need a tool to realise your head knowledge of how to prevent Goldendoodle matting, here is one for you. Aside this, they’re also good for smoothing coats without pulling the fur. 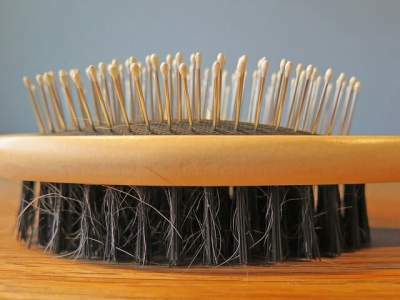 And the even spacing of the metal bristles reduces pressure to the pet’s skin. It’s also good to get a puppy used to this kind of brush early on, as your Goldendoodle is going to need a lot of grooming. The Hertzko Self Cleaning Slicker Brush. Is another wildly popular slicker brush for intensive dog grooming. It has a great design, with close metal wire bristles. The handle sticks up from the brush pad itself in a vertical direction, allowing for an easier time drawing the brush through your Goldendoodle’s fur. This brush also has a self-cleaning one-push button – after all that brushing and grooming, it can be so nice when brush cleanup is a breeze! What’s interesting about this model and design is that there’s a feature that allows you to retract the bristles back into the brush with one button push. That means all the dirt and hair is left outside the brush for easy cleaning. This top Goldendoodle brush is advertised for all sizes of dog and all hair types. The bad side is that: The bristles can be hard at times and reviewers have complained of it piercing their dog’s skin when it comes out of the brush. Also, some dogs do not like the clicking sound the button makes and others said it didn’t help on dogs with very short hair. Safari Pet Products Self-Cleaning Slicker Brush for Dogs, Large. is a uniquely shaped self-cleaning slicker brush designed to smooth and de-mat your dog’s thick coat without tugging or pulling on the skin at all. The ergonomic design pulls through the hair easily and the one-push button retracts the bristles for easy cleaning. For other goldie owners, the best brush for Goldendoodles is a pin and bristle brush. With its all-inclusive brush-like action and all-inclusive action that penetrates through the thick coat, you can work out tangles while smoothing the hair. HaloVa Pet Comb, Professional Double-Sided Pin & Bristle Bamboo Brush for Dogs is made up of a bamboo handle pin and bristle brush gives you a handy all-in-one tool to easily comb out tangles and mats and then add smooth and shine to your dog’s coat. The pin side has rounded ends to make sure your dog’s skin is protected. AtEase Accents Natural Bamboo Eco Friendly Pet Grooming Dog is a bamboo eco-friendly pin and bristle brush that boasts of a sturdy construction with a comfortable handle and round-tipped pins to protect your pup’s skin. Reviewers and owners say it is durable and well-made and works great even on thick-coated pups like the Golden Retriever. Wahl Large Pin Bristle Brush is one highly rated and popular pin and bristle brush features a soft ergonomic rubber grip handle to make brushing time easier on your hands. This is one of the best brush for goldendoodle you can ever find around. The pin side has rounded ends, and the bristles are sufficiently long to work well on denser or longer coats. The best brush for Goldendoodle puppy dogs is generally a simple bristle brush. This is one that so resembles the one you probably use on your own hair. All set? Let’s find out the best brush for Goldendoodle puppy in the market right now! Delomo Pet Grooming Gloves is both gentle and soft grooming brush and is a great choice for your puppy’s first experiences being groomed and brushed. Get yourself a pair of these gloves a they will follow the movement of your hands and make sure your pup feels like he is being petted on the back rather than brushed. Plus, you’d be able to really feel your puppy’s body contours and learn to control brushing pressure in various body areas. The gloves come with an adjustable wrist strap so you can get a customised, ergonomic fit. Conair PRO Dog Pet-It for Dog, Boar Bristle Brush is one brush you can choose from six different brush types because the best options for a puppy are likely to be the Boar Bristle Brush, the Soft Slicker Brush, or the Shampoo/Massage Brush. This brush is hand-held with a curved palm handle to give you more control over your brush strokes. KONG ZoomGroom, Dog Grooming Toy is a rubber puppy brush and another great choice for your puppy’s first experiences with grooming. It features looks more like a toy than a typical brush and the soft rubber bristles stimulate your dog’s skin and growing coat, giving a gentle massage while you brush. In addition to or aside the slicker brush, puppy brush and bristle brush options you’ve already reviewed, you might want to consider these additional grooming tools for your Goldendoodle. Here are 3 more options for Goldendoodle grooming combs to help and smoothen out tangles and mats quickly and painlessly. This popular and highly rated grooming comb features both narrow and wide grooming tines with rounded tips to help work out mats and tangles effectively and gently. If you prefer to use different combs for different areas, and one large steel rounded-end grooming combs will help you work closely on different areas of your dog’s coat. Is a specialized steel round-tip comb helps you work closely on mats and tangles to fastly untangle them. The soft ergonomic handle helps ease hand tension as you work. We will share with you now the best detangler for Goldendoodle skin types ( thick, and curly-coated). For active pups like the Goldendoodle, mats and tangles and mats sometimes become a burden. This is why choosing a good detangling spray can really make a difference in both the time you spend working out tangles and your pooch comfort level at-home grooming. Over the years, this brand reputation has earned it recommendations by breeder, groomers,a dn owners for use with Goldendoodles to remove mats and tangles. Owner and reviewers praise this detangler, saying it works like charm to remove mats and makes their pups smell AMAZINGLY SWEET. This detangler states it can cut brushing and grooming time by half. Owners say it does a fine job to remove deep tangles and mats, even on thick-coated pups. There are lots of other great slicker brushes, pin brushes, and bristle brushes available. Here are some of the other top quality brushes we like for grooming your Goldendoodle. Chris Christensen brush goldendoodle brush is preferred by many dog groomers and show groomers. Plus, Chris Christensen has been one of the top names in dog grooming supplies for decades. Their products last for years and are top quality. This brush has ground, polished tips on stainless steel pins and a lightweight body beechwood with an easy-grip handle. The cushion is firm and durable. 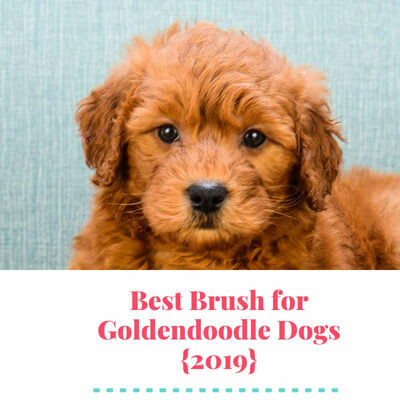 Made in Germany, We are happy to recommend this oval pin brush from Chris Christensen as the best brush for Goldendoodles for our esteemed readers. The cushion is durable and firm. Made in Germany. We are happy to recommend this oval pin brush from Chris Christensen as the best brush for Goldendoodles. This is another brush we like from Chris Christensen is this T-Brush, 16 mm with the funky shape. The T-shape makes it easy to cover a lot of your dog’s body at one time when you’re brushing. 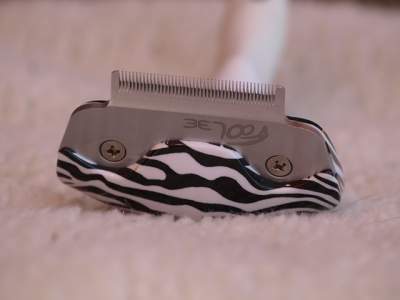 The contoured handle makes it super nice to hold and avoid any wrist or hand fatigue when you’re grooming your dog. The handle and brush are made of lightweight breechwood. The ground, polished tips of the pins are stainless steel. This pin brush features widely spaced pins so it’s not likely to damage or break your dog’s coat. We like lots of Chris Christensen products, including some of their slicker brushes, but we consider them too expensive to recommend for pet owners (we hope you’re not vexed but we put your financial health first). If you’re a professional groomer the cost may be worth every dollar spent on it but we can’t justify the expense for a pet owner. Luckily, there are some very good slicker brushes that are affordable for pet owners. #1 All Systems is another top quality company when it comes to dog grooming supplies. This is why we included it in our review of best brush for goldendoodles pet. This oblong shaped pin brush with a wooden handle which features 1-inch stainless steel pins able to move deeply into your dog’s coat. The pins are demagnetized so there is less static when brushing your dog’s hair. The brush has an ergonomically molded plastic handle to reduce stress on your arm and hand. 8 inches long, the cushion pad is a little shallower than most other pin brushes so the pins are less likely to be pushed down into the cushion when you are brushing your dog – a great advantage! The pins also rotate when they encounter mats or tangles, reducing discomfort for your dog. We can recommend just about any brush from #1 All Systems (Trust us, you won’t regret it). We hope this honest review article has helped you pick the best brush for Goldendoodle puppies and adult dogs! Do you have a favorite Goldendoodle grooming product we didn’t mention? Please let us know your personal experience of the best brush for Goldendoodle– we love to learn from our readers!